Setting off from the beach below Rose des Vents restaurant, a fun swim followed by a tombola to raise money for the Ombre et Lumiere Monaco association. In previous years, the swim was known as the Bain de Noel and took place before Christmas. 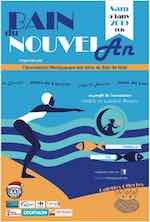 Organized by the Association Monegasque des Amis du Bain de Noel. For more information email bdnmonaco[at]gmail.com and visit the organizer's facebook page at: Association les Amis du Bain de Noel de Monaco.